www.MercuryCards.com - Mercury MasterCard Conversion and Activation - Deal Biscuit - Eat The Info! In a minute, we will review the information relevant to the conversion process which is currently underway for former Barclay customers as their accounts transition to Mercury Accounts. For other Mercury Customers, you can access your full online account through www.MercuryCards.com. For first time visitors who need to activate your new credit card, you can simple follow the activation link where you will be prompted to enter your full credit card account number, the final four numbers of your social security number, and your birth month and year (MM YY format). Once you have entered your account details your card is fully activated online and then will be ready for use. Your online account is activated you can set up your online account. In addition to credit card activation, potential customers who have received a mail offer for the Mercury card can access their offer through the Mercury Card website. You will need to enter your Reservation Number and the last 4 of your SSN to access your application. If you no longer have your reservation number you can search your offer by providing your last number, the last 4 of your SSN, and your zip code. Currently, some Barclaycard customers are receiving their new Mercury MasterCard which will be available for activation once received and will be the replacement card for their Barclaycard. This transfer from one credit card issuer to another is due to an acquisition of accounts from Barclay which were purchased by Mercury (Credit Shop Inc). The accounts which were purchased are now being changed from the former Barclay Card to a Mercury MasterCard. 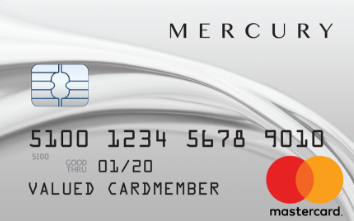 Once you card is ready for activation you can set up your new account with Mercury and your old account will expire.